When Namco?s Tales of Symphonia was released on the Nintendo GameCube in the summer of 2004, most reviewers, including this one, felt obligated to point out that Tales was being dropped into an ?RPG-starved? console. While the latter half of 2004 gave a much-needed injection of respectability into the Cube RPG library, there remained few true 50+ hour epics for Nintendo?s console beyond the aforementioned Tales of Symphonia and Sega?s Skies of Arcadia Legends. But Namco wasn?t quite finished with the console, and released its second Cube RPG in November of 2004. Baten Kaitos (which literally means ?in the stomach of the whale?) is the product of a veritable dream team of collaborators whose resumes include some of the most well-respected role-playing games on the market today. The fruit of their labor is a lengthy, ambitious game that integrates an unlikely combat system into that which Japanese RPG?s know and love. The plot, scripted by Masato Kato (Chrono Trigger, Chrono Cross) begins with the story of two young heroes who live in a world of floating islands. Kalas, a boy, is looking to avenge the death of two close relatives. Xelha (pronounced ?Shella? ), a young girl, is on a quest to save the world from a destructive plan. You, the player, are neither of these characters. Instead, you play the part of a ?guardian spirit? who is bonded to Kalas and guides him through his journey. In gameplay terms, it means that you can influence, but not always dictate, Kalas?s decisions. The plot, meanwhile, is a straightforward one, but it also contains a couple of shocking plot twists that should be expected from the writer of the Chrono series. This is the longest Cube game I?ve played to date. I finished the first disc in 25 hours, and so I naturally figured I?d beat the game in around 50. But the game continued to roll well past that, and when it was said and done I logged around 70 hours of gameplay, including most sidequests, before finally reaching the game?s long ending. (For context, I beat Skies of Arcadia Legends in 50 hours and Tales of Symphonia in just over 60 hours.) Baten Kaitos, unfortunately, doesn?t offer a ?New Game +? style mode like Tales does, but still offers enough to do in one go-around that you?ll get your money?s worth out of it. The bulk of the game is fairly linear and most of the game?s early sidequests are self-contained within an area. Typically you?ll arrive at a specific location, do all the main quest and sidequests you can do there, then move on. Much like Kato?s Chrono Trigger, the game does finally open up and become more non-linear in stretches along the latter third of the game. Also, there are some quests that are progressively completed through the game. For example, early on a dying old man asks you to find all of his relatives, and you?ll spend the bulk of the game running into them in the different places you visit. Oftentimes getting their cooperation requires a minor side trip of some sort, or in some cases a major delay until the more non-linear parts of the game. As has been widely-publicized, everything in Baten Kaitos, including food and weapons, is stored on magical cards, known as Magnus cards. But let?s get one thing very clear: this is not a card game. At least, not like Yu-Gi-Oh or Lost Kingdoms. This is a traditional turn-based RPG that uses cards for all of its combat actions. Instead of clicking on menus and selecting attacks, you instead string your attacks together by choosing a string of cards in a real-time fashion. Far from being a plodding turn-based system, combat can be quite frenetic, and later on the game you will have a matter of moments to assess your party?s health, decide on a card combination, and string that combination together. While this can lead to some tense moments, it also makes for combat that is rarely dull. Functionally, there are three views to the game. The field map, which looks like the field maps of most RPG?s, is where you will spend most of your time, whether it be in towns, in dungeons, or out in the great bounds of nature. There are no random battles, and enemies are clearly visible on-screen. Often these enemies can often be avoided, if you wish, but other times the paths are too narrow to slip by and you?ll be forced to engage the enemy. But at least you know what you?re getting into. The second view, a world view, is essentially a giant map from where you can travel from point to point. There are no enemies here, and any areas you have successfully traversed on the field map can be completely bypassed on this view if you choose. This is one of the nice touches to this game, as you won?t need to hack your way back an forth across an island if you don?t want to. The third view is, of course, the combat screen, and it features a very deep and engaging system. You can bring up to three characters into the field of battle, and the turns play out in order based on character initiative. In a given turn, your character can play a certain number of cards in his or her deck, either for the purposes of damaging an enemy or healing a friend. Additionally, each card has one or more numbers on it, and coming up with various poker-style number combinations can increase the output of your cards. At first the whole idea can be a little challenging, as you have only a small deck to work with, but as the game progresses you will have more cards to work from and thus will have more flexibility. The random nature of the cards is a consideration, but the game is balanced in such a way that a bad hand is not necessarily fatal. Oh, and don?t expect to be sitting around during your enemies attacks; you can actually play defensive cards against your foes? attacks if you are willing and able to. Some offensive cards also offer some decent defensive capabilities as well, and some cards will have different effects on defense than on offense. There are some one thousand cards in the game that include everything from swords and other melee weapons to restorative foods to truly off-the-wall items that have interesting effects (i.e. a rooster that can cure Sleep). Cards played in specific sequences can actually lead to the creation of new cards, and cards will also change over time, meaning that your grapes (which heal) will eventually rot (causing damage) but will later ferment into wine (which will heal even more) and later deteriorate into vinegar (which will cause even more damage). Many of your items will evolve into bigger and better items given time, which is a really cool mechanic in this game. There is money in Baten Kaitos, but don?t expect to find it on your neighborhood monster. Instead, you make your money by snapping photos using a camera card that you can put in your deck. The value of these photos varies with the enemy and the quality of the photo. Photos take time to develop and will appreciate in value as they become more clearer. Although your best equipment will be found in the field, you will still find at least a few important items in the local shops you visit. In creating the characters and settings for Baten Kaitos, Monolift Soft turned to the same people responsible for the art design of Square-Enix?s masterpiece, Chrono Cross. It should come as no surprise, then, that the scenery in this game is visionary and at times simply jaw-dropping. The moment you put in disc 1, you?re treated to an opening CG video that is best described as pure, unadulterated eye candy. From there, the game showcases beautiful pre-rendered backgrounds; your character walks around through dusty rooms bathed in sunlight, runs through the haze of roaring flames, treads through glassy knee-deep water, and walks among wisping clouds that curl in the wind. Those adjectives aside, this game?s settings can?t be described. Nor do the screenshots do it full justice. The game just has to be seen. I?ve never seen a GameCube game that even approaches the level of artistry and style found here. On a technical level, the character models are nicely-crafted and will even change subtlety in light and reflect off polished surfaces. There is no lip synching during the dialogue but the game does feature nice art sketches of each character in the dialogue box. The combat engine, which isn?t far off the pace of Final Fantasy X, features smooth attack animations with some really spectacular spell effects. There are a few minor quibbles with the graphics. First and foremost, there are, unfortunately, no CG sequences outside of the game?s introduction; instead, all of the cutscenes, right up until the end, are handled with the game?s graphics engine, supplemented by a little artistic flair here and there. Secondly, some of the game?s areas are so huge that it?s hard to make out much detail, which is sad because this game is so pretty and shouldn?t be seen from afar as it sometimes is. Thirdly, the combat engine doesn?t have the spectacular backgrounds of the field map. Overall, though, these issues don?t really take away from what is still an awfully pretty game. The score for Baten Kaitos is nothing short of incredible, and the game even includes a tuner to go back and listen to your favorite tracks. Motoi Sakuraba (Star Ocean 3, Tales of Symphonia) really broke his own mold with folksy balads, acoustic guitar sets, wispy woodwind melodies, brassy military anthems, tragic string sonatas, a couple of rock sets, a creepy tune that would be at home in ?Psycho,? and even a memorable punk set. A couple of the tunes hearken back to old Mega Man themes, while the main battle anthem is an eclectic tune that oddly grows on you as you work through the game. It?s clear that Namco went for quantity over quality in the voice acting department, with more extensive voicework than Tales of Symphonia (or any other GameCube game, for that matter) but with fewer big names. Several of the main voices are pretty solid ? Kalas, Gibari, and Giacomo, for example, are all really good ? but some of the other voices, such as Lyude and Xelha, come off as flat and uninspired. Oddly enough, the voicework in the game?s opening FMV and the voice acting in combat are both much stronger than the voice acting in the rest of the game. The combat voicework, in particular, is well done and can also be ? in the case of Gibari ? downright hilarious. Why the voicework outside of combat wasn?t up to par with the voice acting in combat is unclear. In any event, I was perfectly fine with the voice acting, but if it bothers you, you can easily turn it off from the options menu. As is typical, field controls follow the tried-and-true setup for character movement (using the control stick), actions (A), and menus (Y). 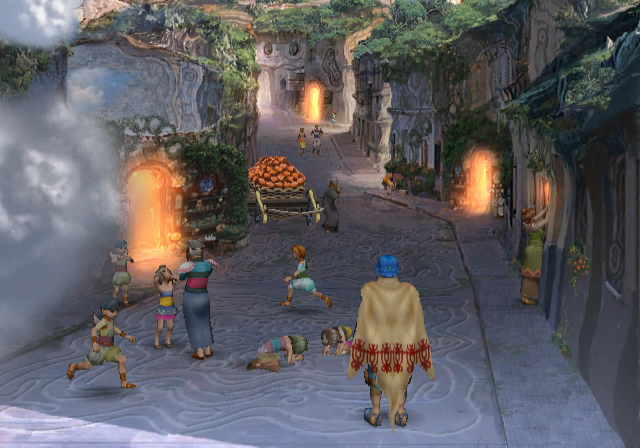 But it is in combat where Baten Kaitos takes really nice advantage of the GameCube controller. Novices to the game will start by highlighting cards with the control stick and choosing them with the A button. If you pay attention to the combat advice dispensed early in the game, though, you?ll gradually move toward using the + directional pad and the c-stick in combat, and by the end of the game this configuration becomes essential. The d-pad is actually much easier at rapidly moving from card to card, while pointing the c-stick toward one of the corners allows you to use one of up to four numbers on a given card. Meanwhile, the L and R buttons are used to target enemies (for attacking) or allies (for healing and support abilities). If there is a downside to the combat controls, it is the fact that it is often difficult to defend an opponent?s first attack. This is an intentional component of the gameplay, however, and is one of the many tactical considerations in the game. A game that allows you to collect up to one thousand cards had better have a solid interface, and Baten Kaitos delivers here, with fully sortable lists accessible through the Y button. Cards can be easily moved and reshuffled, and the menus can easily be configured to show your weakest cards at the top so you know what to replace as you get bigger cards. Baten Kaitos is rated T for blood, mild language, and fantasy violence and is probably best suited for gamers 13 and older. The fantasy violence is probably the most self-evident in a game of this type, and the mild language has more or less become the standard fare among T-rated RPG?s. Expect only a very small amount of blood, plenty of combat, and a few scattered profanities. Gamers should also be aware that there are also some adult themes in the game, including a vague reference to \'naughty books,\' a scene that implies the presence of an \'adult\' magazine, and a detailed, though not explicit, discussion on infidelity that was probably toned down from the original Japanese version. The thematic issue of murder and revenge is also central to the game. And, like most RPG?s, spells are a part of the game?s combat. Baten Kaitos is also full of ethical issues. Most notably, you (a guardian spirit) are often presented with dialogue trees, and given the option to make moral decisions ? usually things like whether or not to help someone or whether or not to fight someone. At the same time, answering in a way Kalas agrees with will improve your bond with him, unlocking better special attacks in combat. In practical terms, this means that you will sometimes find yourself in a situation where you will have to choose between making a ?moral? choice that might hurt your bond with Kalas and choosing a more ?questionable? path that will improve your combat efficiency. Talk about moral discomfort! I found it a bit unsettling that a game would force me into these kinds of decisions, but it also opened up some interesting reflections about moral choices and how good decisions can still have repercussions. Finally, expect to run into a healthy share of religious issues. The ?dark god? Malpercio is a major plot point throughout the game, particularly during the latter half. Faith is a major theme, particularly through the eyes of Xelha. The idea of church and religion is also central to the game, as it is through ?prayer? that your character levels up. The game operates under an alternate mythology of gods and goddesses; there are a few twists to that mythology that couldn?t be revealed without spoiling the pot, but expect a few conventional ideas in the game to be turned on their head. A lot of gamers are likely to dismiss Baten Kaitos as a ?card RPG,? and that?s too bad, because this is such a nice tale with such marvelous production values. And the card system is, much to this reviewer?s surprise, a real blast to use once you dive into it. Overall, the level of artistry and care that went into this game is something rarely seen these days. Although, sadly, Namco probably won?t sell a lot of copies of this game, they have reason to be really proud of the end product. In my view, Baten Kaitos is arguably the Cube?s best RPG, and if you are a fan of Japanese RPG?s like Final Fantasy or the Chrono series, you will feel right at home with this excellent title. Highly recommended.